They Should Be Proud, Right? Monsanto is very proud of their developments – so they tell us – and yet are spending exhorbitant amounts of money to hide that very pride. Wherever people begin a drive to insist on full disclosure, the corporation brings out its lawyers to quash the entire movement. They keep telling us that their product is better than natural foods because… well, it just IS, that’s all. And it makes them a helluva lot more money than natural crops ever did, that’s for certain. And in today’s technology-is-great mindset, the very idea that we made food – up until recently something that was only in the bailiwick of nature itself – is really something we can gloat about. So, rather than hide the fact, they should be proud! 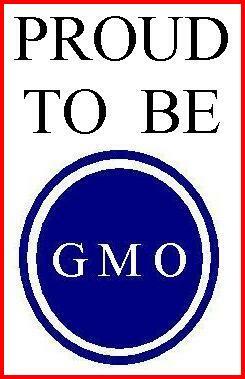 Here’s the label they should be putting on all GMO foods to show their pride in their accomplishments. I am certain the consumers – equally prideful in what amazing technology we have – will clamor to buy the stuff. Having their lawyers attempting to circumvent the food labeling laws by claiming GMO is not really “food” is counter-productive. They should stress that not only is it FOOD, it is better than real food because technology has made it better; science has triumphed yet again. The people at Monsanto have got to stop being so defensive. If they were a little more proactive with their advertising, they might be a little more successful. If I saw one of these labels at the store, I know I would have to buy it. I mean, they are bound to be a collectible some day as rare as they are going to be. But for the past several weeks, I have seen at less four a day. What can be going on in the skunk world to drive so many of these fellows out onto the road late at night and stand around until someone volunteers to help in their “assisted suicide”. And we have quite a few Kervorkian-on-wheels it would seem. And if it was an occurrence in one isolated stretch of road, it would be one thing. And only one area to hold your breath driving through. But the crime scenes change daily and the ripe odor spreads over a larger demographic daily. Soon there will be no “clean air” locations anywhere along my drive to work. Perhaps the phenomenon is only happening in Northern Virginia. I wonder if it is happening in your locality as well? And does anyone know what it means? It seems that all the genetics were there… but something went wrong. Something about the “recessives” I think they are called. My brothers got the good stuff. One’s a astrophysicist, one’s an engineer, and one’s a programmer… and me, I seem to have been hardwired for humor (or “so-called” humor, at least). Dad was a systems analyst for NASA back in the day when working for NASA was exciting. Not like more recently when it was all maintenance and failed Mars missions, back when the men with the right stuff were strutting around making a pathway to the Moon. And all four boys were infused with that scientific bent. But why would three keep going strong and the fourth one (which, ahem, would be yours truly) seem to run out of folds in the gray matter to tuck any more information? Is there some sort of cure for this thing or is it incurable? Is it even a disease? I know I am un-eased by it. Sigh. Though I do not know how it happened, I can at least be thankful I am not earning my living in one of the scientific fields. I mean, how would it feel to wake up one morning and think, “Okay, so it’s a Higgs boson. So what?” That would really put a crunch in the old paycheck. But at least I have been spared that little problem. At least I won’t be deemed out-of-date. I tell you what! I am not one of those who can keep up with the constant changes coming in the scientific fields. Just like I mentioned in my first book… well, my only book so far: technology has left me in the dust. But this latest thing really has me baffled. These guys are detecting energy being thrown out of the Black Hole in the center of the galaxy. And now they even have stars that are trucking across the galaxy at a million miles an hour that were flung out of the same Black Hole. So, maybe physics has changed a bit since I was in school but I thought the entire concept of the Black Hole was that NOTHING escaped from it. Not even light. That’s why it is black. Perhaps the even horizon is more permeable than they theorized. Maybe the inexorable forces relax at certain times. Or maybe the Hole just wants to have a little fun and throw things away. I don’t know. But isn’t it a truly marvelous field where you can theorize things that don’t fit the rest of the theory? And the best thing is these guys get PAID for these wild surmises. Me? I can surmise all day – wildly or otherwise – and don’t get the time of day from anyone. But that’s why I’m the village idiot. I read about a young man named Aaron Swartz who was so upset about his upcoming trial and pending jail time that he committed suicide. Sure, it is always sad when young people (he was only 26) take their own lives when faced with really difficult situations. It is hard on the family and the friends as well as, in this case, people who were followers of the young man. You see, he was a leader in the cause of free and open internet access. He did not believe things should be kept FROM people if it was data that should be freely accessible. And rather than make some new version of the FOIA, he created a manifesto and started a digital revolution. Both claims are just wrong. Having been suicidal – in my younger days, so you don’t have to worry… they canceled that “suicide watch” some forty years ago – I have a pretty good understanding of what that entails. I have done volunteer work as a suicide watcher for cases of very depressed people and I don’t believe the very depressed kill themselves. The young man did not let on to anyone that he was A) despondent, B) depressed, or C) suicidal. There was no note, nor any clue as to the why of his action. And as his lawyers were fairly certain he was going to walk for his supposed crimes, what was his rationale for ending it all? As for the man being a martyr… It is a subject I have studied in some depth (see my forthcoming volume How to Be a Martyr (or Die Trying) for more details) and I cannot see how an intelligent person would have chosen this method for martyrdom. There should have been some statement about the reasons behind his death, whether a suicide note, a rant about his cause(s), or something. Yet the press is calling it a suicide and a martyrdom when it seems to be nothing more than a simple murder. Conspiracy theorists are probably going to be all over this one but I cannot see that a conspiracy is required for someone to have had a motive. Whether or not the police ever investigate the case further, there is another death recently that comes to mind. In July, a Chicago man, Urooj Khan, won the lottery and then dropped dead. It was reported as a simple “death by natural causes”. Several members of his family fought to have more done on the case as they suspected foul play. It took four months before they re-examined the evidence and found cyanide. It has now been declared a homicide. I can see something like this happening in Swartz’ case. Suicide and martyrdom make absolutely no sense. Revolutionaries and visionaries are not in the habit of bailing out when the going gets tough. At least, none that I have ever seen. Well, the geothermal saga is over!! In the week after Thanksgiving, we had an electrical contractor arrive to upgrade our electrical system. After which, I contacted Mike Strasburg again, because he had promised to send someone “right over” as soon as the upgrade was completed. The weekend before Christmas, Mr. Strasburg finally sent someone over to fix the system. Himself. Apparently, all the different guys he had sent over during the month’s long process of installing our system he had fired because “they were incompetent”, he said. For the past several weeks he had been doing repair work on the faulty installations those idiots had done. Poor guy! So, I told him he ought to at least wait a few minutes. My wife got even more adamant and told him to wait a few. “But I have other service calls.” And he opened the door and fled. And, of course, the house did not get any warmer because it still wasn’t working. Fortunately, I had the foresight to order another cord of wood to be delivered or we would have frozen to death over the Christmas Break. Calling him was useless as no one answered at the office and he wasn’t answering his personal cell. After a couple of days, I got the message that his cell’s voicemailbox was full. He even had the audacity to tell me that he had a technician in our neighborhood who refused to do our house because my wife had taken attitude with him!! Funny, if I had an employee who refused to do a job, or follow a direct order… well, never mind. Anyway, I hung up on him. Then I got an email saying he would have a technician come over on Saturday and check to see if it was user error and was covered by the warranty. Otherwise he would have to charge us! Yes, as if he was going to charge me for the trip. He said, we’re an installation company, not a service company. Anyway, we left a short note for the tech explaining what Mike had said during the previous visit – you know, in case Mike didn’t tell them what he had already done – and took our pre-planned road trip. To our delighted surprise, the house was nice and warm when we arrived back that evening. And the tech left his card. He was not even an employee of OnSite Energy, he was a subcontractor… actually, as it turned out, a competitor. This evening, the fellow called us to see if we were happy with his work and he explained the non-relationship with Strasburg. He had been hired to do several repair jobs for OnSite and found angry customers at every stop. He was starting to feel sorry for Strasburg. That is, until he got to our house. He said the other houses were at least relatively warm. Our house was freezing. And he wondered what sort of businessman would schedule the situation with the highest priority dead last? Well, Mike Strasburg, that’s who. And the very worse part of the entire adventure, after Mike had already spent over an hour “trying to find the problem”, this tech said he opened the system and saw two wires had not been connected. Total time to “fix” our system? Two minutes. And Strasburg, the geothermal “engineer” couldn’t figure it out. The geothermal system is wonderful and much more efficient that our previous fuel oil burner system. And you would do well to look into such a thing. Just don’t bother calling OnSite Energy in Northern Virginia. That Mike Strasburg is definitely bad business! I wrote about the Windows® placebo last week but there is another placebo that is found far more often – and used – in our daily lives. And I am not talking about the “Push Button for Walk Signal” things you find on street corners. Some of those actually work! What I am talking about is the pleasant little button found on elevators, adjacent to the “hold door open” button for allowing late arrivals to get on the car. Yes, that pesky little “close the doors” button. So many times – on far too many elevator journeys to count – there is always the impatient rider who, the moment someone had exited the car, pushes the “close door” button so he (or she) can hurry up to their floor which is, quite naturally, the most important thing in the universe. And quite often, when the doors do not respond instantly, they push it again and again, until the apparently dim-witted doors finally respond. I saw it again today. A gentleman – looking a little ruffled by his rush into the building – pushed the “call car going up” button. There was a ding and the doors opened on the left elevator but the light was glowing red, arrow pointing “down”. The man was chomping at the bit as the doors closed, anticipating it would discover its foolish neglect, reopen to a green (“going up”) light. It wasn’t to be. Naturally, he returned to the button he had originally pushed – still glowing white to show that it was working – and pushed it again. And then again. And then again after looking back to the inept elevator. A second elevator chimed and opened, but was also glowing with the dreaded red menace. The fellow repeated his ritual of button pushing. Finally, the first elevator arrived again, glowing green, and he muttered something as he rushed forward… stopping short when he realized the elevator had indeed gone down and brought up passengers. He had to step out of the way to keep from being bowled over by those exiting. At last, we were able to join the three other people heading for higher altitudes. And you can imagine his face as he punched his floor’s button, “6”, atop the other floor buttons that were already glowing white. Yep, you guessed it. Everyone was getting off on a different floor and ALL before his destination. He leaned in the corner at the back of the car, a faint whimpering emitting from his throat. After the second floor passenger got off, he leaned forward to push the “close door” button but the doors had already begun to close. At the next floor, he maintained his new position closer to the panel so that the moment the passenger disembarked, he punched the button. Of course, nothing happened. He reached for it again, just as the doors closed. The next floor was my own and the fellow was punching the button like an maniac even before I got out of the car. The door still did not close until the usual five seconds after the last passage through the electric eye on the doors. I can only imagine the shape of his finger after the next floor, the last before his own, as he punched madly attempting to shorten that five-second eternity. People… that button is there for the fire department to take control of the car, not you. And you have to have a special key to get it to work. You can use the “hold door open” button anytime to help get people on but the elevator companies are not about to let you – or anyone else – close the doors in someone’s face. Yes, it’s just a placebo, even if it can make your blood pressure go up faster than you are. Whoa! Hold on a moment… don’t get off on a rant here… the question was rhetorical and only used in this context to set up my piece. Those rants have a proper time and place, like later and on your own blog. So, you encounter some “little” problem with Windows® – stay with me – and the program extends the offer to “fix” the problem for you. And then the answer flashes on your screen. And it is never an answer you want because it now implies that you have to call the Geeks Squad or the store where you bought the computer or – a fate worse than DEATH – you’ll have to call the Microsoft help line… even though you really don’t have the four-and-a-half hours to hang on to the phone waiting your turn in line (hearing repeatedly the warning about losing that precious place in line if you should hang up) or you’re on a cell phone and your charger is nowhere to be seen. But you could have saved yourself the momentary elation that Windows® had given you if you had merely looked at the small message at the lower left of the pop-up window, as seen below. Tomorrow it will be here. Wow! Like, I can hardly w8! I caught the short demo of the new system with its checkered graphical display and even a link to the Windows “app-store”. I would call that extremely innovative (Bill Gates’ catch-word, not mine) wouldn’t you? Except that I have a feeling I have sort of heard of this thing before. Maybe I had a premonition of it, I dreamed it (or nightmared it), or maybe it’s because it sounds a lot like some Apple products I have heard of… once… you know, or twice… or so. But then that really would be innovative, wouldn’t it? I mean, I don’t really think Windows has so closely copied anything from Apple before, have they? Well, only that windowing thing. I recall that was all from trying to copy the Apple OS, but that is ancient history these days and we don’t even bother counting that sort of copy-catting. Not when we have a new, virtually innovative bit of copy-catting going on. I may decide to take it for a spin in 2014, which would be about a year sooner than I generally try out Windows systems… you know, like after they have worked all the bugs out.